We’ve all heard snippets about the rise and fall of this Texas giant. Fear and trepidation is spreading across the country about the demise of Social Security. Even the faithful that are admitted to President Bush’s propagandized town meetings shudder about the youth of America being entrusted with investing their future. But big business carries on. Except for one big business – Enron. We’ve all heard snippets about the rise and fall of this Texas giant. But, alas, like the S&L scandals of a decade ago, white collar crime doesn’t play as well on CNN as repeated footage of tsunamis carrying human beings out to sea. 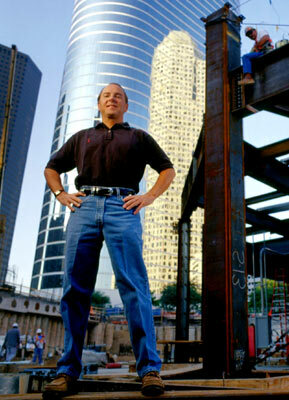 Enron: The Smartest Guys in the Room is an intelligent documentary. It requires the viewer to commit almost two hours of viewing and listening time to learn how Chairman Ken Lay (or “Kenny-boy” as George W. refers to him) and CEO Jeff Skilling negatively affected thousands of lives (millions, if you count Californians affected by the energy blackouts). The telling of this financial disaster was easy to document for several reasons; the audacity of its corporate subjects, the intelligent reporting of Fortune magazine reporters Bethany McLean and Peter Elkind, and the skilled direction of documentary filmmaker Alex Gibney. There is really no need to skew the film to sway the audience, the facts speak for themselves. If you’re fortunate enough to have a 401k with your employer (in other words, if you are not a freelance writer), imagine being told it was a safe and profitable account to continue investing in even as the bigwigs were busy cashing in. Then, when you did realize your financial savings were in jeopardy and you tried to access your remaining nest egg, you learn a freeze had been put on salvaging your dwindling balance. Peter Coyote’s distinctive voiceover is on the money and the selected tunes augmenting the soundtrack contribute far more than the average two cents. Movies that portend to serve as history lessons usually rank low in accuracy. Consider a viewing Enron: The Smartest Guys in the Room a graduate lesson to be taken seriously.